We value the implementation of a comprehensive curriculum to prepare our students for college and career readiness. We value a learning environment that promotes the physical, social and emotional well being for each student. We value the opportunity to shape each student by modeling integrity, intentionally teaching character traits and encouraging a strong work ethic. We value our community as a vital component of the educational process. Our success is defined by the strength of our community. Great News! 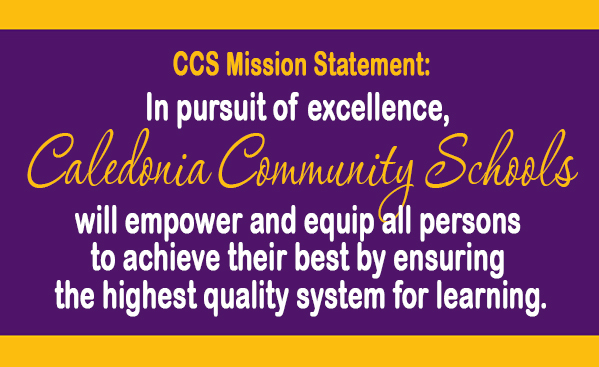 - School Safety Grant The Caledonia Community Schools administrative team is proud to announce that our school district was one of 48 districts to receive additional funds from the 2018 Competitive School Safety Grant through the Michigan State Police. With the assistance of Deputy Frederick on behalf of the Kent County Sherriff’s Department, our administrative team sought out this competitive grant opportunity to assist with our continual efforts to create a safe learning environment for our students and staff. This award of $82,420 will be utilized towards various security upgrade features for each building over the next two years. Monday, April 8, 2019 B-Day Student Council will have a meeting this Thursday, April 11th at 7:30am in the library. Cancer Walk has officially begun! Our first big event is the Runway for Ribbons Fashion Show this coming Friday at 6:30pm right here at Duncan Lake. Tickets can be bought in advance in the main office and are only $5.00. Mr. Graham will be our Master of Ceremony and Mr. Veitch, Mr. McLoughlin, Mr. Traughber and I will be modeling some awesome Cal Wear. This is a once in a lifetime experience - donâ€™t miss it. Want a Cancer Walk t-shirt? Order forms were given to all of the focus teachers or you can get a form from the office. (7th Graders) If you have any old clothes, gloves, stuffed animals, or toysâ€¦.please donate them to the Goodwill boxes located in the 7th Grade hallway or in the commons. Happy birthday today to Katelyn Rooney and Riley McNutt. Happy belated birthday to Carter Bosserman, Ellery Lienesch, Analise Kaminski, Mason Langeland, Aubrianna Rekis, Alex Klingensmith, Payton Diehl, Christian DeYoung, Evan DeYoung, Lydia Ed, Zachary Maurer, Tyler Dean, Alyksander Hanson, Anthony Roszkowski, Olivia Stauffer, Alexandra Hance, Olivia Lappenga, Ryan Stafford, Shannon Munger, Leah Felker, Owen Hager, Carter Moorlag, Megan Russell, Lauren Mahoney and Camden Garris. Staff thisi is just a gentle reminder of Scots tickets there are another 10 in your mailbox this morning Please stand with your right hand over your heart for the Pledge of Allegiance. Listen to your teachers, Try your very best, and Make it a great day! Tuesday, April 9, 2019 A-Day Student Council will have a meeting this Thursday, April 11th at 7:30am in the library. Cancer Walk has officially begun! Our first big event is the Runway for Ribbons Fashion Show this coming Friday at 6:30pm right here at Duncan Lake. Tickets can be bought in advance in the main office and are only $5.00. Mr. Graham will be our Master of Ceremony and Mr. Veitch, Mr. Traughber and I will be modeling some awesome Cal Wear. This is a once in a lifetime experience - donâ€™t miss it. Want a Cancer Walk t-shirt? Order forms were given to all of the focus teachers or you can get a form from the office. Applications are currently available for leadership positions for both Student Council and National Junior Honor Society for next year. You must be a 7th grader and currently a member of either organization to apply. Applications are available outside the Activities Office door by the blocks. See Mrs. Alexander if you have any questions. (7th Graders) If you have any old clothes, gloves, stuffed animals, or toysâ€¦.please donate them to the Goodwill boxes located in the 7th Grade hallway or in the commons. Final orders for yearbooks are due this Friday. (No birthdays today) Please stand with your right hand over your heart for the Pledge of Allegiance. Listen to your teachers, Try your very best, and Make it a great day! Wednesday, April 10, 2019 B-Day Student Council will have a meeting tomorrow at 7:30am in the library. Donâ€™t forget the Runway for Ribbons Fashion Show this coming Friday at 6:30pm right here at Duncan Lake. Tickets can be bought in advance in the main office and are only $5.00. Mr. Graham will be our Master of Ceremony and Mr. Veitch, Mr. Traughber and I will be modeling along with a new addition - Mr. Deryder from Kettle Lake. Donâ€™t miss the fun! Bring in your $5 tomorrow! Want a Cancer Walk t-shirt? They are only $12 and order forms are available in the office. Applications are currently available for leadership positions for both Student Council and the National Junior Honor Society for next year. You must be a 7th grader and currently a member of either organization to apply. Applications are available outside the Activities Office door by the blocks. See Mrs. Alexander if you have any questions. There will be 8th hour EUCHRE in Ms. Cizauskas' room after school tomorrow! (7th Graders) If you have any old clothes, gloves, stuffed animals, or toysâ€¦.please donate them to the Goodwill boxes located in the 7th Grade hallway or in the commons. Final orders for yearbooks are due this Friday. Students just a reminder that you have the ability to earn SCOTS tickets for doing random acts of kindness Happy Birthday wishes today to Celeste Bayer. Please stand with your right hand over your heart for the Pledge of Allegiance. Listen to your teachers, Try your very best, and Make it a great day! Thursday, April 11, 2019 A-Day Student Council is meeting right now in the library. Tomorrow during school is the last time you can buy your $5 tickets for the Runway for Ribbons Fashion show. Tomorrow night at the door the tickets will cost $10.00. This is a once in a lifetime event with a DJ, high school students modeling amazing prom wear, principals parading down the runway in Cal Wear. You donâ€™t want to miss it. Doors open at 6:30pm. There will be concessions available as well. Want a Cancer Walk t-shirt? They are only $12 and order forms are available in the office. Applications are currently available for leadership positions for both Student Council and the National Junior Honor Society for next year. You must be a 7th grader and currently a member of either organization to apply. Applications are available outside the Activities Office door by the blocks. See Mrs. Alexander if you have any questions. There will be 8th hour EUCHRE in Ms. Cizauskas' room after school today! Reminder today is the LEGION field trip to Sky Zone. We will be meeting at the blocks at 2:15 to take the bus there. (7th Graders) If you have any old clothes, gloves, stuffed animals, or toysâ€¦.please donate them to the Goodwill boxes located in the 7th Grade hallway or in the commons. Final orders for yearbooks are due tomorrow. Students just a reminder that you have the ability to earn SCOTS tickets for doing random acts of kindness Happy Birthday wishes today to Lauren Kingsbury. Please stand with your right hand over your heart for the Pledge of Allegiance. Listen to your teachers, Try your very best, and Make it a great day! Friday, April 12, 2019 B-Day Tonight is the Cancer Walk Runway for Ribbons Fashion Show at 6:30pm. Tickets are still available for $5 in the office today during school. Tickets will cost $10 at the door. The Cancer Walk cart will be out next week with all sorts of great items like pens, pencils, shoelaces, socks, bracelets and much more. Make sure to check it out. Cancer Walk t-shirts are still on sale as well. (7th Graders) If you have any old clothes, gloves, stuffed animals, or toysâ€¦.please donate them to the Goodwill boxes located in the 7th Grade hallway or in the commons. Final orders for yearbooks are due today. Band students, remember to bring your instruments home to practice and take your quiz which is due by Sunday at 11:59 PM. The winner of the March is Reading Month contest in the library is Hannah Dupuis in Ms. Lulichâ€™s focus. Please see Mrs. Sprau about redeeming your prize. Students just a reminder that you have the ability to earn SCOTS tickets for doing random acts of kindness Happy Birthday wishes today to Nathan Sines. Please stand with your right hand over your heart for the Pledge of Allegiance. Listen to your teachers, Try your very best, and Make it a great day! pril 15, 2019 A-Day Runway for Ribbons congrats (7th Graders) If you have any old clothes, gloves, stuffed animals, or toysâ€¦.please donate them to the Goodwill boxes located in the 7th Grade hallway or in the commons. Builders club meeting Wednesday at 7:30 in room 302. Congratulations to Natalia Quigley, who took 2nd place in her age group in the Gazelle Girl 10k on Sunday! Great work Natalia! Students just a reminder that you have the ability to earn SCOTS tickets for doing random acts of kindness Happy Birthday wishes today to Alex Antcliff, Victoria Glass and Valentina Glass. Happy belated birthday to Noah Fennell, Rebecca Hornacek, Andrew Emery, Raghan Sinclair, Shawn Dover, Landon Siler and Miranda Dunham. Please stand with your right hand over your heart for the Pledge of Allegiance. Listen to your teachers, Try your very best, and Make it a great day! Tuesday, April 16, 2019 B-Day (7th Graders) If you have any old clothes, gloves, stuffed animals, or toysâ€¦.please donate them to the Goodwill boxes located in the 7th Grade hallway or in the commons. Builders club meeting tomorrow at 7:30 in room 302. Science Olympiad is holding itâ€™s Awards Dessert tomorrow, Wednesday, at 6:30pm in the Kraft Meadows Home Ec Room. The Cancer Walk Cart will be out at lunch tomorrow. Check out all the cool stuff we have for sale to help raise money for Cancer Walk. Students need to be in the cafeteria, gym or commons. Students just a reminder that you have the ability to earn SCOTS tickets for doing random acts of kindness Happy Birthday wishes today to Jared Porter and Kiana Haywood Please stand with your right hand over your heart for the Pledge of Allegiance. Listen to your teachers, Try your very best, and Make it a great day! Wednesday, April 17, 2019 A-Day Builders club is meeting right now in room 302. Science Olympiad is holding its Awards Dessert tonight, at 6:30pm in the Kraft Meadows Home Ec Room. Today is a make-up 8th hour for Pinterest Crafts after school. This is for students that did not complete projects or need to pick up projects. Please meet in the library. 8th grade spanish students, please bring your computers to class today. The Cancer Walk Cart will be out at lunch today. Check out all the cool stuff we have for sale to help raise money for Cancer Walk. Students just a reminder that you have the ability to earn SCOTS tickets for doing random acts of kindness ( No birthdays today) Please stand with your right hand over your heart for the Pledge of Allegiance. Listen to your teachers, Try your very best, and Make it a great day! Thursday, April 18, 2019 B-Day Today will be the last 8th hour euchre class in Ms. Cizauskas' room. 8th Grade students, please bring headphones to class next week for MSTEP testing. Students just a reminder that you have the ability to earn SCOTS tickets for doing random acts of kindness Math Olympiad team members should report to the blocks immediately following these announcements. The MS Tennis team defeated Allegan 10-9 last night. After falling behind 0-6 the team did a great job winning several close matches. Great job Today the tennis team travels to Pinewood. Our Caledonia MS Boys & Girls Track Teams will be hosting their first track meet of the season at HOME Today against the Wayland Union MS Wildcats. Track Meet starts @ 4:00 pm. The Lost & Found is growing! Please stop by and see if something might belong to you. Wishing a very Happy Birthday to our very own DLMS ParaPro - Mrs. Batchelor & Transitions Teacher/Daily Grind Coordinator - Mr. Adam Chamberlain. Please stand with your right hand over your heart for the Pledge of Allegiance. Listen to your teachers, Try your very best, and Make it a great day! Friday, April 19, 2019 A-Day 8th Grade students, please bring headphones to class next week for MSTEP testing. Band students, remember to bring your instruments home to practice and take your quiz which is due by Sunday at 11:59 PM. Students just a reminder that you have the ability to earn SCOTS tickets for doing random acts of kindness (no birthdays) Please stand with your right hand over your heart for the Pledge of Allegiance. Listen to your teachers, Try your very best, and Make it a great day! Monday, April 22, 2019 B-Day Donâ€™t forget to check out the Cancer Walk cart at lunch this week! And Cancer Walk t-shirts are still on sale. Order forms are available in the office. Have you heard? For every $50 you raise for Cancer Walk - your name will be put into a drawing for a pair of AirPods. Donâ€™t wait till the last minute- start thinking of ways to raise money to fight cancer today. 8th Grade students, please bring headphones to class this week for MSTEP testing. Happy birthday wishes today to Reese Geister. Happy belated birthday wishes to Hayden Stanley. Students just a reminder that you have the ability to earn SCOTS tickets for doing random acts of kindness Please stand with your right hand over your heart for the Pledge of Allegiance. Listen to your teachers, Try your very best, and Make it a great day! Tuesday, April 23, 2019 A-Day The Cancer Walk Cart Movie Night is next week. Take a minute at lunch today and vote for your favorite movie to see. It is free to vote and your vote will enter you in the raffle to win a huge jar of candy. The Cancer Walk Movie night will be May 3rd. Hey fellow Scots, on Wednesday April 24 Dakota will be selling pop and candy for the Cancer Walk outside of the 7th grade hallway. Pop will be a buck a can. Candy will be 25 cents each or 5 for a buck. All of the proceeds go to the 11th annual DLMS Cancer walk. Next week Mrs. Bravataâ€™s class is also holding a giant cake walk during lunches on Wednesday and Thursday May 1st and 2nd. Tickets will be on sale next week and It will only cost $1 to participate. Just a reminder to current 7th and 8th grade NJHS members, your service hour forms are due April 30th and can be turned into the main office or Mrs. Alexander. 8th Grade students, please bring headphones to class this week for MSTEP testing. Our CMS Tennis Teams will be playing their matches at HOME Today against Crestwood MS. Match Time: 4:00 pm. Happy Birthday wishes today to Brady Hilaski, Coach Nixon & Mrs. Sanford :) Students just a reminder that you have the ability to earn SCOTS tickets for doing random acts of kindness Please stand with your right hand over your heart for the Pledge of Allegiance. Listen to your teachers, Try your very best, and Make it a great day! Wednesday, April 24, 2019 B-Day Peer to Peer LINKS will have a meeting with Mrs. Torres this Friday. Meet by student services during your lunch time. This will be the last official meeting before your end-of-the-year celebration! The Cancer Walk Cart Movie Night is next week. Did you vote yesterday? Will it be Bumblebee or Jumanji? - to close to call right now. Make sure to vote today if you havenâ€™t already. It is free to vote and your vote will enter you in the raffle to win a huge jar of candy. Only one vote per person. The Cancer Walk Movie night will be May 3rd. Hey fellow Scots, today Dakota will be selling pop and candy for the Cancer Walk outside of the 7th grade hallway. Pop will be a buck a can. Candy will be 25 cents each or 5 for a buck. All of the proceeds go to the 11th annual DLMS Cancer walk. Next week Mrs. Bravataâ€™s class is also holding a giant cake walk during lunches on Wednesday and Thursday May 1st and 2nd. Tickets will be on sale next week and It will only cost $1 to participate. Mrs. Belote's class is having a petting zoo during lunch on Friday, May 3 to raise funds for the Cancer Walk. There will be baby goats and calves, a rabbit and a miniature donkey! Cost is $2 for admission and $1 to feed the baby animals. Just a reminder to current 7th and 8th grade NJHS members, your service hour forms are due April 30th and can be turned into the main office or Mrs. Alexander. 8th Grade students, please bring headphones to class this week for MSTEP testing. Starting tomorrow, Thursday, April 25th, there will be â€œOpen Gymâ€ at Caledonia HS Main Gym from 5 to 6:30 pm for any 8th grade Girls Basketball player who would like to come in during that time. Open Gym will be on Tuesdays and Thursdays starting next week. Happy Birthday wishes today to Addyson lash. Students just a reminder that you have the ability to earn SCOTS tickets for doing random acts of kindness Please stand with your right hand over your heart for the Pledge of Allegiance. Listen to your teachers, Try your very best, and Make it a great day! Thursday, April 25, 2019 A-Day Our CMS Boys/Girls Track Team will be getting underway at HOME Today for the start of their season against the Wayland Wildcats. Meet Time: 4:00 pm. The CMS Tennis Teams will be playing their Tennis matches at HOME Today against the East Grand Rapids MS Pioneers. Match Time: 4:00 pm. Current NJHS 7th And 8th Grade NJHS members- this is a reminder that your service hour forms are due to the office or Mrs. Alexander by next Tuesday, April 30th. Donâ€™t be late! Peer to Peer LINKS will have a meeting with Mrs. Torres this Friday. Meet by student services during your lunch time. This will be the last official meeting before your end-of-the-year celebration! Last chance today to vote for the Cancer Walk Movie Night movie and get entered in the drawing for the giant jar of candy! Only one vote person. Also, in Cancer Walk news - Penny Wars start next week! Who will win the penny belt - VanEngen says he is going to win it back again. We will see! Next week Mrs. Bravataâ€™s class is also holding a giant cake walk during lunches on Wednesday and Thursday May 1st and 2nd. Tickets will be on sale next week and It will only cost $1 to participate. Mrs. Belote's class is having a petting zoo during lunch on Friday, May 3 to raise funds for the Cancer Walk. There will be baby goats and calves, a rabbit and a miniature donkey! Cost is $2 for admission and $1 to feed the baby animals. Starting today there will be â€œOpen Gymâ€ at Caledonia HS Main Gym from 5 to 6:30 pm for any 8th grade Girls Basketball player who would like to come in during that time. Open Gym will be on Tuesdays and Thursdays starting next week. Happy Birthday wishes today to Adison Dyksterhouse. Students just a reminder that you have the ability to earn SCOTS tickets for doing random acts of kindness Please stand with your right hand over your heart for the Pledge of Allegiance. Listen to your teachers, Try your very best, and Make it a great day!